Saumya Nigam defended her thesis on 24 October 2016. Administering a cancer drug to the precise location of the disease in the body is a tremendous challenge. One of the biggest shortcomings of chemotherapy is that it affects the non-cancerous parts of the body too. To combat this, some nano materials (chemical particles one-millionth the size of sand grain) are being used as potential delivery agents. 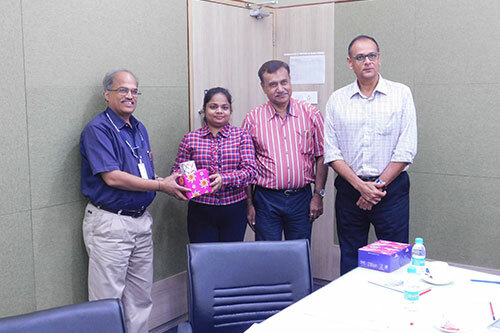 Saumya Nigam, who successfully defended her PhD thesis on 24 October 2016, explored a set of such nano materials in her research. She also performed experiments on mice with the drug to corroborate her findings. Prof. D. Bahadur, her IITB supervisor commented ‘Excellent presentation by Saumya. She defended all the questions extremely well. She had all the confidence while presenting her work’. Saumya now plans to pursue Post-doctoral research. We wish her well!